For imperiled marine turtles, use of satellite telemetry has proven to be an effective method in determining long distance movements. However, the large size of the tag, relatively high cost and low spatial resolution of this method make it more difficult to examine fine-scale movements of individuals, particularly at foraging grounds where animals are frequently submerged. Acoustic telemetry offers a more suitable method of assessing fine-scale movement patterns with a smaller tag that provides more precise locations. We used acoustic telemetry to define home ranges and describe habitat use of juvenile green turtles at a temperate foraging ground in the northern Gulf of Mexico. We outfitted eight juvenile green turtles with acoustic transmitters and tracked them from 14 to 138 days from September 2012 to February 2013 in St. Joseph Bay, Northwest Florida. Mean home range size was relatively small compared to other studies. For four turtles, we observed a moderate inverse relationship between water temperature and water depth which is consistent with the idea that turtles moved to deeper waters when temperatures cooled. On average distance to the channel from turtle locations were different by bottom cover type. These turtles appear to forage in shallow-water seagrass beds that border deep channels. When water temperatures dropped in winter, some of the tracked turtles moved to a deep-water channel on the western side of the study site. Turtles whose foraging sites were farther from the deep-water channel exhibited greater displacement than those with sites that were closer to the channel. Green turtles in St. Joseph Bay have relatively small home ranges and many contain multiple activity centers. The frequent use of channels by turtles suggests bathymetry plays a major role in habitat selection of juvenile green turtles, particularly as temperatures drop in winter. The quality and density of seagrass habitat in St. Joseph Bay and its proximity to deep channels appears to provide ideal conditions for juvenile greens. The results of this study help define characteristics of foraging habitat utilized by juvenile greens in the northern Gulf of Mexico that managers can use in creating protected areas such as aquatic preserves. Although research on marine turtles has increased over the past decade [1–3], gaps in our knowledge still exist, particularly at in-water foraging grounds . This is a serious knowledge gap for species such as green turtles (Chelonia mydas) that are threatened or endangered throughout parts of their range  and which spend the major part of their lives in neritic foraging grounds [6, 7] that are often exposed to multiple anthropogenic impacts [8, 9]. These foraging grounds are geographically diverse [10–13] and recent studies suggest foraging strategies used at different sites may vary . Therefore, understanding how green turtles use foraging habitats throughout their range is critical to their population recovery. Green turtles are generally considered a tropical species and many studies have been conducted at tropical foraging sites such as the Bahamas , Brazil , Mexico  and Australia . Fewer studies have been conducted at temperate foraging grounds and a severe lack of data remains for green turtles foraging in the Gulf of Mexico (GoM). Although stranding data [17, 18] suggest coastal bays in the GoM support a large number of juvenile green turtles, very few studies have examined habitat use in this region [11, 19, 20]. Studies of juvenile greens conducted in Texas [19, 20] and the Florida Everglades National Park  have provided some information on juvenile green turtle habitat use, however, no information on home ranges, habitat use or movement patterns is available for populations in Northwest Florida. Understanding the spatial biology of imperiled marine species can elucidate variability in life history patterns among disparate populations . Increased knowledge of movement patterns and habitat use may be considered a priority for ongoing conservation efforts . For threatened and endangered marine species, use of satellite telemetry has proven to be an effective method in determining long distance movements of sea turtles. However, the large size of the tag, relatively high cost (>$1000/tag) and low spatial resolution of this method make it more difficult to examine fine-scale movements of individuals , particularly at foraging grounds where animals are frequently submerged. Acoustic telemetry offers a more suitable method of assessing fine-scale movement patterns with a smaller, less-expensive tag that provides more precise location information than satellite tags [12, 16, 23–25]. Acoustic telemetry has increasingly become an important research tool [26, 27]. It has been used to address management and conservation issues in a variety of species including fish, sharks, invertebrates, reptiles and mammals [11, 28–31]. Initially, tagged animals were tracked actively by researchers using hand-held (or boat mounted) hydrophones . Because researchers have to follow each individual, sample sizes in active tracking projects are typically small and tracking lengths relatively short [28, 32, 33]. The use of passive acoustic tracking, where receivers are deployed to detect tagged animals as they pass, has therefore increased . While passive tracking has many advantages over active tracking, lack of receivers in some areas or the need for very fine-scale location points requires the continued use of active tracking . Although acoustic receivers have been used in the northern GoM, primarily to track Gulf sturgeon , none exists in our study site. Thus, in this study we used active acoustic telemetry to track juvenile green turtles in a coastal bay in the northern GoM, an area not previously examined. Studies have suggested that juvenile green turtles establish home ranges to provide consistent access to resources that offer the greatest benefit for growth to sexual maturity [16, 24, 36, 37]. In this paper, we describe preliminary calculations of the home ranges and habitat use of green turtles at a coastal foraging area in the northern GoM. Our goals were to: 1. Measure the home range of juvenile green turtles in our study site using both minimum convex polygon (MCP; [38, 39] ) and kernel density estimation (KDE) methods [40, 41] and 2. Describe the habitat use of these turtles within their home ranges. Combining this information with long-term in-water tagging and dietary studies will provide a more comprehensive understanding of green turtle ecology in important coastal foraging habitats in the GoM, thereby providing better insight for conservation and management decisions. We tracked eight juvenile green turtles ranging from 25.6 to 53.0 cm curved carapace length (CCL) and 2.5–18.1 kg (Table 1). These turtles were captured at three locations in the southern portion of St. Joseph Bay and tracked for 14–138 days between 9/28/12 and 2/21/13 (Fig. 1). Sea surface temperatures ranged from 11.3 to 29.4 °C during the entire study period. A total of 139 locations were recorded for all turtles. Not all turtles were located during every tracking attempt; therefore, the number of locations per turtle differs among individuals. The number of days in which a location was recorded for each individual ranged from 3 to 27. Tracking of three turtles ceased due to premature detachment of the tag. Termination of tracking for the remaining turtles occurred when signals from tags were lost presumably due to loss of tag battery life. Home range size varied greatly among individual turtles tracked during this study (Fig. 2). Minimum convex polygons and 95 % KDEs ranged from 0.002 to 9.260 km2 and 1.056 to 2.540 km2, respectively (Table 2). Mean MCP (3.54 ± 1.310 km2) was larger than mean KDE (1.82 ± 0.31 km2). If we drop the three turtles for which we have the fewest location points (CM 1, CM 2, CM 5), the mean MCP for the remaining turtles increases to 5.63 ± 1.37 km2. The largest home ranges were exhibited by those turtles (CM 6, CM 7) that were captured in the northeastern section of the study area by the 3–4 channel (excluding CM 5 who was only located on three subsequent days). The turtle (CM 7) with the largest MCP also had the largest KDE. Home ranges for 2 (CM 4, CM 6) of the 8 turtles overlapped with all of the other turtles. One turtle (CM 8) had a home range that overlapped with all turtles except CM 5. Turtles also used multiple activity centers (defined by disjoint 95 % KDE) within their home ranges, with CM 3 and CM 4 using 5 activity centers each, CM 7 using 7 activity centers and CM 8 using 4. The activity centers were located over seagrass and over deep-water sandy-bottom habitat. Temperatures during turtle captures in St. Joseph Bay ranged from 11.3 °C in January and February 2013 to 20.8 °C in November 2012. There were inverse correlations between water temperature and water depth for four turtles (CM 4, CM 6, CM 7, CM 8; r: −0.62 to −0.48, p < 0.05; Table 3), which is consistent with the idea that they moved to deeper water when the temperature cooled. This relationship was not evident with CM 1, CM 2 and CM 5 as tracking for these turtles ceased prior to the onset of cold weather in NW Florida. It was also not evident with CM 3 even though this turtle was tracked through the winter from 10/6/12 to 2/21/13. On average, with all turtle locations combined, distance from the channel was significantly different by seagrass types (continuous, discontinuous, and other; F = 3.83; p = 0.0003). Results of multiple mean comparisons showed that the mean distance from the channel was greater in continuous seagrass cover type. As turtles moved further away from the channel, the water became shallower and the amount of continuous seagrass increased. Turtles were located more often over sand (55.8 %) than over seagrass (44.3 %), except for CM 1 who had a relatively small home range (MCP 0.058 km2) and was located predominately over sand. The turtles with the largest home ranges (CM 4, CM 6, CM 7, CM 8) were located predominately over sand whereas those turtles with smaller home ranges (CM 2, CM 3, CM 5) were located predominately over seagrass (Table 4). The total displacement of each individual turtle during its entire tracking period (range 14–138 days) also varied and ranged from 0.14 to 43.41 km; however, when we removed the three turtles for which we had the fewest location points from this analysis, the range narrowed to 13.61 to 43.41 km (Table 5). With all turtles, the mean total displacement was 14.94 ± 5.10 km; without CM 1, CM 2 and CM 5, the mean total displacement increased to 23.22 ± 5.21 km. The turtle that had the largest home range (CM 7) also had the greatest displacement. There are few estimates of home range size for juvenile greens and those available vary in size. Although sizes of home ranges most likely vary due to resource availability and other factors, some of that variability may also reflect the tracking and analytical methods used in each study. For example, McClellan and Read  tracked turtles using both satellite tracking and manual acoustic tracking and reported maximum MCPs were less than a third of the size when gathered using acoustic technology than with satellite tags. In addition, among different studies, home ranges are also frequently calculated differently, which makes comparisons problematic. Small sample sizes typical with active tracking projects can also be a challenge when estimating home range size. Acoustic tracking is most frequently used to document fine-scale behavior, estimate survival, and observe movement patterns of aquatic organisms  whereas for home range analyses, satellite tracking is often used [43–45]. However, animals that establish small home ranges in relatively shallow-water habitats may be difficult to track using satellite tags; particularly small sea turtles where carapace growth in juveniles often results in short tracking times [16, 46]. The use of acoustic telemetry for home range analyses of juvenile sea turtles can provide longer tracking periods and more detailed movement data. In active tracking, the challenge in using this method is ensuring large sample sizes. Seaman et al. suggest a minimum of 30–40 location points before home range estimates can be accurately calculated using the KDE approach. When that is not possible, methods such as MCP are often used [24, 48]. The home range sizes we reported here were most similar to sizes reported off the east coast of Florida  and Northeast Australia  where juvenile green turtles forage along offshore reef structures. The small home ranges we documented here are more similar to home range sizes reported for juvenile hawksbills (Eretmochelys imbricata) that also forage on reef systems [25, 49, 50], than for juvenile greens foraging in seagrass habitat [11, 16, 42, 51]. Although green turtles at our study site forage primarily on seagrasses [17, 52], the quality and density of resources available to greens in this relatively small area (approximately 3500 hectares of seagrass habitat; ) within this relatively small bay (18,000 hectares) may permit such small home ranges, as was suggested by Cuevas et al. and Berube et al. for hawksbills. Although the home ranges used by greens at our study site were small, some contained multiple activity centers that were documented over both open water and seagrass habitat. Turtles may use different activity centers for a variety of reasons. They may move among foraging sites if resources at one site are lost or if a site becomes unavailable due to factors such as human disturbance [16, 42]. Turtles have also been shown to use different areas for foraging and resting . Perhaps the activity centers we documented over sandy-bottom habitat in channels were used as resting areas during mid-day and those over seagrass habitat were used for foraging, similar to what was reported by Taquet et al. in the Indian Ocean. Finally, turtles may move in response to environmental conditions such as tides [42, 56] or temperature [57, 58]. As ectotherms, sea turtles are constrained by thermal as well as physical factors affecting their environment . At many temperate foraging grounds, turtles have been documented moving out of the region to warmer areas during winter [42, 60]. Another strategy turtles may use to survive winters in temperate waters is to move to deeper water during cold spells [58, 61]. Although preliminary, our small sample size suggests that at least some green turtles in St. Joseph Bay do not leave the bay when temperatures drop but instead move to deep water. It has been suggested that once juvenile greens settle in neritic habitat they may exhibit a dichotomy in seasonal movement patterns with some showing fidelity to foraging areas [11, 15] and others undertaking migratory movements typically in response to changes in water temperature [19, 58]. Although we have a small sample size in this study, our results suggest turtles in St. Joseph Bay exhibit fidelity to their home range, even when water temperatures drop during winter. This is evident in the home ranges of CM 3, CM 4, CM 7 and CM 8 that include activity centers in both shallow seagrass habitat and within the deep-water channel. This is also supported by cold stun stranding events in which thousands of juvenile greens have stranded in St. Joseph Bay during extreme weather events [17, 18]. Carman et al. suggested these seasonal movements into oceanic waters are site specific and we agree; the deep-water channel and availability of gelatinous prey (such as tunicates) in St. Joseph Bay  may allow juvenile green turtles to remain in the bay throughout the winter. Movements made by turtles in response to temperature may help explain why turtles captured on the east side of the bay (CM 6, CM7) had the largest home ranges of the 8 turtles tracked in this study. Those two individuals traveled to the deep-water in channel 11 on the west side of the bay during cold temperatures rather than moving into deep-water closer to their capture site on the east side of the bay. Our results suggest these turtles consistently traveled within the channels rather than over shallower water, perhaps to avoid predators such as large sharks. The turtle with the largest home range (CM 7) also had the greatest displacement over the tracking period (Table 5). Compared to other acoustic tracking studies, juvenile greens in St. Joseph Bay underwent relatively large displacement from their tagging locations during this study. In North Carolina, McClellan and Read  found juvenile greens moved 2–11 km during their study period (8–74 days) whereas turtles in our study moved 1.5–43.4 km. Mean displacement was also greater than that reported for greens in Hawaii (2.62 ± 0.96; ). This may reflect our low sample size that is being skewed by two turtles (CM 4 and CM 7) that made large movements or may reflect seasonal movements of turtles from their foraging sites into the deep water channel located on the west side of the bay. The consistent use of these channels that we report here suggests that bathymetry plays an important role in habitat selection for green turtles. Hart et al. reported that adult greens in Dry Tortugas National Park frequently foraged in shallow-water seagrass habitat that was bordered by deep channels, and Shaver  found juvenile greens frequently foraged in the Mansfield Channel off the southern coast of Texas. These channels most likely provide quick access out of shallow water where turtles are more vulnerable to predators , and at temperate foraging grounds these channels not only provide escape from predators but also provide turtles with quick access to deep water when temperatures drop . These deep sandy-bottom channels may also serve as resting locations for greens, particularly during mid-day . As Hart et al. suggested for adult greens, we also suggest for juvenile greens that bathymetric constraints drive habitat selection for this species. Although seagrass may have been available in other locations at this site, juvenile turtles foraged in seagrass beds that provided access to channels. 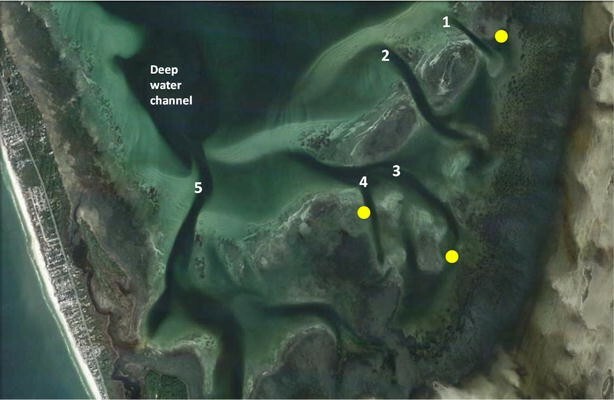 Use of these channels as resting places may also explain why four individuals in this study were located predominately over sand habitat rather than seagrass. Because of logistics, all locations during our study were collected during daylight hours (range: 9:54–19:20 h) and most often (66 %) between 13:00 and 16:00 h. Bjorndal  suggested green turtles in the Bahamas take a break from foraging between 10:00 and 14:00 h when they rest in areas with a sandy or rocky bottom. In addition, Mendonҫa  suggested greens fed on seagrass flats in mid-morning and mid-afternoon, and moved into deeper water during mid-day hours for resting. Because we recorded many of the locations during mid-afternoon (66 %), we may have captured turtles resting in channels over sandy bottoms more often than we documented turtles foraging over shallow seagrass. This, however, does not explain the behavior of individual CM 3. Most locations (67 %) for CM 3 were documented between 13:00 and 16:00 h yet 74 % of the locations were over seagrass which suggests this turtle was either foraging during these mid-afternoon hours or resting over shallow seagrass rather than in the sandy-bottom channel. Due to logistic constraints, we were unable to track turtles during this study for 24-h periods, therefore, limiting ourselves to information on daylight movements only. However, 24-h tracking at this foraging ground is now possible and is currently being conducted at this site to fill the gaps identified in this initial study. Results of this study provide a preliminary definition of day time home range sizes, describe turtle movements in response to temperature changes, and highlight the importance of bathymetry in habitat selection for juvenile green turtles at a temperate foraging ground in the northern GoM. Consistent use of this coastal habitat by green turtles suggests that bays in this region provide critical habitat and environmental conditions for foraging green turtles. Stranding information for other bays in the northern GoM, including St. Andrew Bay and Pensacola Bay, indicate they also support juvenile green turtles. However, the quality and density of seagrass habitat in St. Joseph Bay and its proximity to deep channels appear to provide ideal conditions for juvenile greens. Human activities that take place in the coastal environment such as fishing, boating, and oil and gas exploration serve as potential threats to sea turtles and their foraging habitat [5, 48]. The results of this study help define characteristics of foraging habitat utilized by juvenile greens in the northern GoM that managers can use in creating protected areas such as aquatic preserves. However, additional tracking is needed to better understand the diel and seasonal requirements for this species in the northern GoM. St Joseph Bay is a semi-enclosed coastal inlet encompassing ca. 18,000 ha in the northern GoM, along the coast of the Florida Panhandle (; Fig. 3). St Joseph Bay is 21 km long with a maximum width of 8 km and a mean depth of 7 m; the greatest depth is 13.3 m at the northern end and the shallowest is 1 m at the southern end. The southern portion of the Bay is considered a lagoon primarily because it functions as a semi-closed system with little or no current . Turtles were captured and tracked in the southern portion of the bay (Fig. 1). This area is characterized by extensive shallow (~0.5–1.5 m) seagrass beds transverse by 5 relatively deep (~4–5 m) channels. An even deeper channel (~6–7 m) extends north along the western side of the study site. Captures occurred at three primary sites that bordered channels 1, 3 and 4. The tangle net used for captures was ~100 m long and 3 m deep, constructed with a braided polypropylene top line and a 9.1 kg lead core bottom line, and secured to the bottom with a 3.2 kg anchor attached at either end. The mesh was constructed of 18-gauge nylon twine with a knot-to-knot diameter of 30.5 cm. We set the net and attached bullet-shaped buoys with longline clips along the top line of the net at 7–10 m intervals. We checked the net at intervals of 15 min or less, or whenever something appeared to be tangled in it. Our methods of setting and checking the tangle net were similar to those used by Ehrhart and Ogren  and Hart and Fujisaki . As part of the standard workup procedure for each turtle, we followed established protocols . We individually marked each animal by inserting a passive integrated transponder (PIT) tag in the left shoulder region and affixing individually numbered flipper tags to each of the front flippers. Immediately after marking each animal, we took standard carapace measurements including straight carapace length (SCL) and CCL. We weighed turtles with a spring scale and netting to the nearest 0.1 kg. Additionally, we photographed each turtle to document carapace and skin anomalies. We released all turtles at the site of capture within 2 h.
We outfitted all eight turtles with Vemco V13 continuous acoustic transmitters (6 g in water; 13 mm diameter × 36 mm length) on the right rear marginal scute of the carapace. Where the tag was affixed we removed epibionts (e.g., barnacles, algae) from the carapace of each turtle and sanded and cleaned the carapace with isopropyl alcohol. Acoustic transmitters were attached to the carapace posterior with electrician ‘tie-wraps’ fit through two 3-mm diameter holes drilled in the marginal scutes . Location of transmitters did not interfere with flipper movements. A small amount of epoxy was placed under and then over the transmitter for additional adhesion. Acoustic transmissions ranged from 60.0 to 84.0 kHz; both frequency ranges are outside the hearing capacity of green turtles (30 kHz–1 kHz, ). Instrumented turtles were released at their initial capture location within 2 h of capture. After the release of each individual, we commenced daily tracking efforts to record the location of turtles and determine home range size. Tracking occurred during daylight hours only due to logistic constraints. We attempted to record a minimum of one re-sighting position each day using an acoustic receiver (VR100, VEMCO Ltd., Nova Scotia, Canada) with an omnidirectional and a directional hydrophone to monitor acoustic transmissions. To initiate tracking each day, we began by going to the point of capture for each turtle and listening for tags at that spot. If no tags were detected, we began a grid-based search of the region. For this search method, the southern portion of the bay was divided into 11 grid cells. We began by searching within the grid cell where the turtle was captured and listened for all tags. We traveled along transect lines within each grid cell that ran either north/south or east/west depending on water conditions (i.e., if large swells hampered a north/south direction, we traveled east/west). If no turtles were detected within that grid cell, we moved to an adjacent grid cell that was chosen randomly. Not all turtles were detected on all search days. Occasionally, conditions required us to return to land before all turtles were detected. A 6-m Boston Whaler with a 95-horsepower outboard motor was used for all tracking efforts. To minimize disturbance to the turtles, each re-sighting coordinate was determined by maneuvering the tracking vessel to within 10–20 m of the turtle and recording the location of the tracking vessel with a Global Positioning System (GPS). Locations were only used in analyses when acoustic signals were evident at a maximum of 1/12 gain with a directional hydrophone . Water temperature and water depth were collected using a Humminbird 798c (Johnson Outdoors Marine Electronics, Inc, Eufala, AL, USA) mounted on the survey boat when a tagged turtle was located. On a few occasions, equipment failure prevented us from gathering temperature and depth information and these days were left out of analyses. Coverages of habitat extent and characterization in St. Joseph Bay from 2010 were provided by the Apalachicola National Estuarine Research Reserve. Because seagrass extent can change annually and seasonally, habitat type (sand, seagrass, sand/seagrass interface) was recorded whenever a turtle was located during tracking events to ground truth the habitat coverages. The center of each channel was recorded using a hand-held GPS and water depth measurements documented using the onboard Humminbird 798c. We examined Pearson’s correlation coefficient between water depth and water temperature at observed locations by each turtle. Using ArcGIS, we identified seagrass type at each turtle locations and measured distance from each location to the center of the channel. A single factor Analysis of Variance (ANOVA) F test was conducted to test the difference in distance from the channel by seagrass cover type (continuous, discontinuous, and other) and followed by multiple mean comparisons. We created MCP of all turtles using ArcGIS. For those turtles with more than 20 days of observations, we created 50 and 95 % KDE contours with fixed-kernel least-squares cross-validation smoothing factor (h cv)  using Home Range Tools for ArcGIS extension . Following previous studies, we rescaled the data to select the best bandwidth when we observed unequal variance in latitude and longitudes . We calculated the area within MCP and each of 50 and 95 % KDE contours of each species as well as area of each seagrass cover type within MCP. Total displacement was calculated for each turtle by summing all of the distances between two consecutive observations. MML initiated and designed the study. MML, BSS, and CH conducted all field work and handled all data management. IF conducted data analyses and created figures, and MML, IF, BSS, and CH drafted the manuscript. All authors read and approved the final manuscript. Habitat information was provided by K. Wren and C. Snyder at the Apalachicola National Estuarine Research Reserve. We thank K. Hart at USGS-SESC for use of acoustic tracking equipment. This work was conducted under National Marine Fisheries Permit #17183. All turtle handling and sampling was performed according to the Institutional Animal Care Protocols USGS-SESC-IACUC 2011-05. The authors declare that they have no conflicts of interest. Any use of trade, product, or firm names is for descriptive purposes only and does not imply endorsement by the U.S. Government.